Grab an umbrella, it's going to rain Tuesday. That's the assurance from NBC 5 meteorologist Grant Johnston, who has forecasted morning sprinkles will give way to heavy rain and possibly even a few thunderstorms Tuesday afternoon as a cold front pushes into North Texas. Just before 2 p.m., the National Weather Service issued an urban and small stream Flood Advisory for Southeastern Dallas County, Northern Ellis County, Southern Hunt County, Kaufman County and Rockwall County until 5 p.m.
Johnston said he expects the rainfall to amount to between 1 and 2 inches for most of the Metroplex. While some thunderclouds may develop, severe weather is not expected. As the cold front arrives, Johnston said temperatures will fall from the 70s in the morning to the upper 50s by sunset. 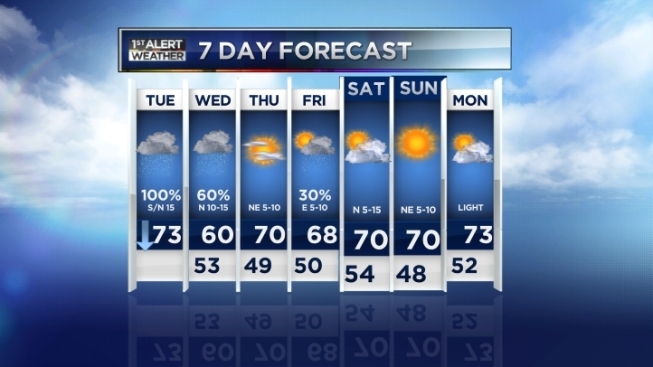 On Wednesday, it's expected remain chilly with a few lingering showers. Sunshine returns on Thursday before another chance for rain on Friday. Get the latest forecast information and see maps and radars on our weather page here. Parts of Central Texas are also bracing for more rain Tuesday evening into Wednesday as the cold front pushes south. The National Weather Service says as much as 4 inches of rain could fall in some areas of Central Texas, creating the possibility for flash floods. A section of the state stretching from the Big Bend area, across Central Texas and into northeast Texas is under a Flash Flood Watch. In Central Texas, that watch runs from 5 p.m. Tuesday until 7 a.m. Wednesday where rainfall should average 1 to 2 inches. That would come as people continue to clean up following torrential rains that amounted to as much as a foot in a 12-hour period last weekend near Austin. Those rains forced organizers to cancel the final day of the Austin City Limits Music Festival. In the Panhandle, the cold front has prompted frost advisories for Amarillo where low temperatures Tuesday night are expected to get close to freezing. In the valley, a Flood Warning has been issued for Laredo north along Interstate 35 past Cotulla and east toward Corpus Christi, where recent rainfall has kept rivers above flood stage for several days.